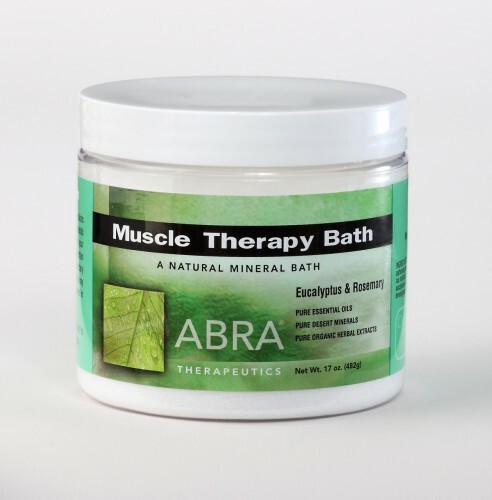 Muscle Therapy Bath is used for the comfort and recovery of sore muscles, providing a greater range of muscle motion and performance with a blend of natural minerals and organic herbs of eucalyptus (E. citriodora) and rosemary (Rosmarinus). Sore muscles are one of the big complaints of all times. Proof of this would be that the oldest durable structures are bathing houses situated upon natural springs often associated with healing warriors. Muscle stress is usually associated with overexertion, but soreness does not have to come through over-activity. Sometimes it's just a wrong movement or position that strains a muscle group. A lot of muscle soreness comes from sluggish circulation or even mental stress. In all cases the muscle fibers become stiff, cramped and sore. One of the beautiful things to happen in the Muscle Therapy Bath is called “residual extension”. This is an effect that relaxes the muscle and allows it to stretch or extend without cramping back. Muscle Therapy also aids in better performance. Athletes know how this works. “The greater the muscle-relaxing phase, the greater the activity phase.” On a graph it would be like a wave moving below and above a base line. The wave mirrors itself above and below the line, the deeper the rest phase the higher the activity phase. If the rest phase is shallow the performance phase is equally shallow. This is also linked with strength and stamina, as well as relief of muscle pain. Directions: Pour desired amount into running bath water, about one capful per average bathtub. Swirl to dissolve. Set temperature to an ideal 102F. Bathe for 20 minutes. After 10 minutes, massage the skin with a loofah or brush to increase benefit. Underwater stretching will also increase the benefit. Safe for spas and hot tubs. Click the button below to add the MUSCLE THERAPY MINERAL BATH - Eucalyptus & Rosemary, Jar to your wish list.